Former Secretary of State Henry Kissinger warned senators Thursday that nuclear proliferation from North Korea’s weapons program is a greater threat than Pyongyang attacking the United States. “My fundamental concern about the nuclear program of Korea is not the threat it poses to the territory of the United States, significant as it is,” Kissinger told the Senate Armed Services Committee. “My most immediate concern is the following: If North Korea still possesses a military nuclear capability in some finite time, the impact on the proliferation of nuclear weapons might be fundamental. 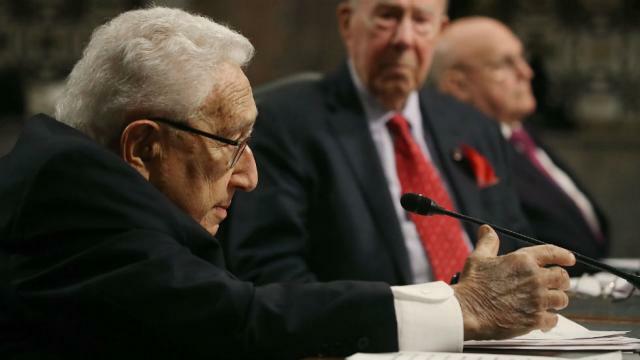 Kissinger was testifying about national security strategy alongside fellow foreign policy heavyweights George Shultz, who was President Ronald Reagan’s secretary of State, and Richard Armitage, who was deputy secretary of State in the George W. Bush administration. North Korea and nuclear weapons were a chief concern of the committee and the witnesses as Pyongyang continues to make progress on its program and the Trump administration prepares to release a Nuclear Posture Review. A leaked draft of the review includes plans to develop “low-yield” nuclear weapons to deter Russia and China. On proliferation, Kissinger outlined a scenario in which South Korea would not want to be without nuclear weapons if the North has them, which would then lead to Japan following suit. “And then we’re living in a new world in which technically competent countries with adequate command structures are possessing nuclear weapons in an area in which there are considerable national disagreements,” he continued. Kissinger also warned about the consequences of a war with North Korea, particularly the factors that Russia and China would play. Throughout the hearing, Shultz also expressed concern about the Pentagon’s upcoming Nuclear Posture Review, set to be released next month. Shultz said he read an early version of the strategy and that it appeared to him to imply a willingness to use nuclear weapons.